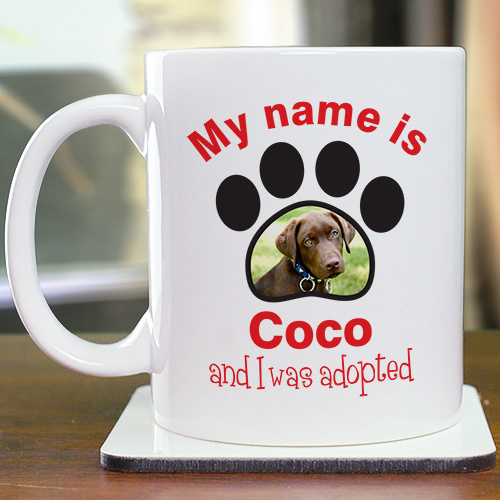 Having an adopted pet is something to be proud of, and this personalized coffee mug will allow you to show off just how proud you are to be an adoptive parent of a beloved dog. The added picture on this adorable mug will really make this a great gift for any proud adoptive pet owner you may know. This Pet Adoption design can be printed on one of our dishwasher safe mugs, available in sizes ranging from 11 ounces to 20 ounces. Free personalization of any name and digital photo is included. Just simply uploads any digital photo below. For production purposes, please enter a description that best describes your photo. Additional Details Personalized gifts like this one are amazing gifts for pet lovers! If you know someone who is proud of their adoptive pet, then this would be the gift that you want to give them. Our Personalized Rescued Dog Printed Frame would be a great gift to complement this one.